Compatible with Magento Mobile App for Multi-Vendor Marketplace. 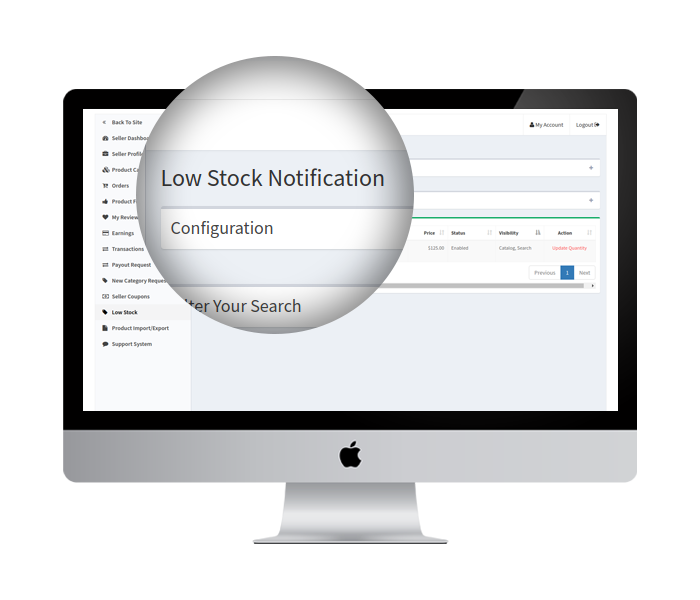 The admin can enable this functionality to send low-stock notification to the sellers from this section of Magento Multi vendor Marketplace module.The store owner can set the inventory limit below which the sellers will be informed about the low stock. The sellers can add their products with quantity and price. All the product data is managed by seller only. The Magento Multi vendor Marketplace plugin supports all type of products like simple, configurable, bundled, virtual and others. The admin can add or remove any of the products from the back-end of the Magento Marketplace extension. Buyers can view list of sellers along with their rating on the marketplace. 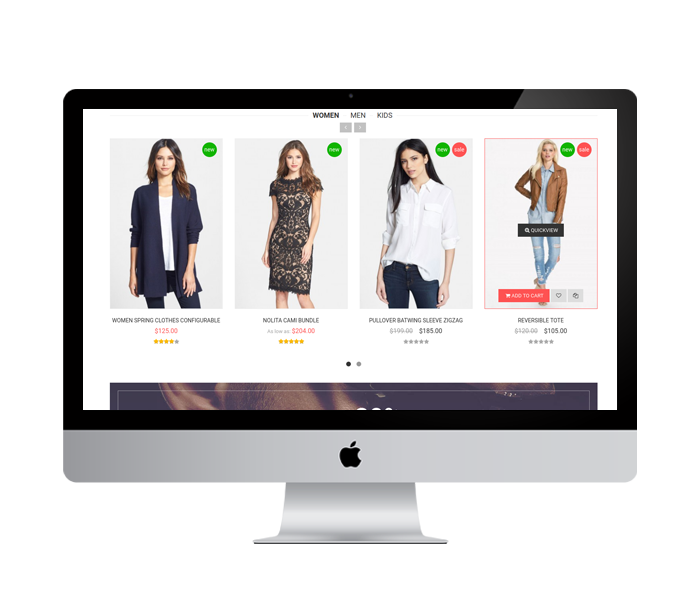 The customers can give product or seller reviews.The admin can approve or reject the seller reviews from the back-end of the Magento Marketplace plugin.The products review will be displayed in the front-end after the admin approves the same from the backend of the Magento marketplace extension. Multi vendor marketplace extension for Magento allows the admin to enable the auto-approve option. 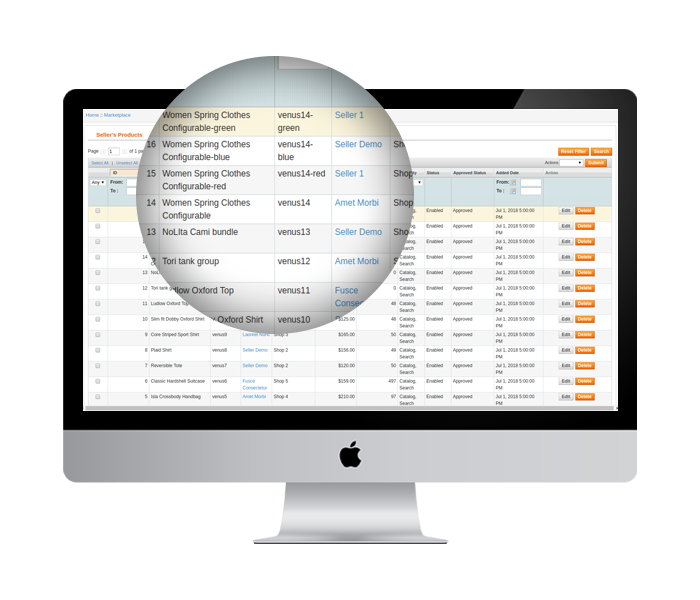 Installing this Magento Marketplace Plugin allows the store owner to manage commissions for vendors. The Magento multi vendor marketplace module offers a provision for the admin to manage the individual and global commission rates for each seller. The admin can set the percentage of commission globally for all sellers.The store owner can even keep track of the commission due of the individual seller from the back-end of the Magento marketplace plugin. 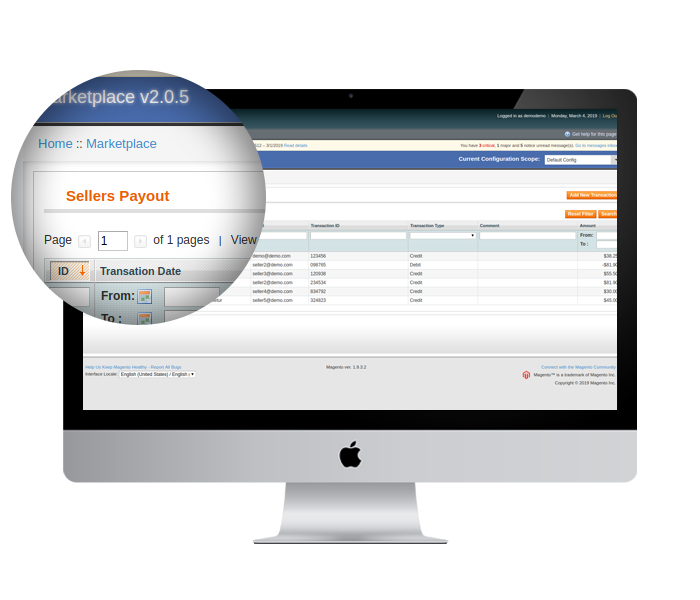 The Magento Multi seller Marketplace plugin makes it easier for the store admin to track the payouts and overall transactions happening at the site.The sellers can request the store owner to process their payout. This can be done after the payment methods are configured in the profiles of the sellers. 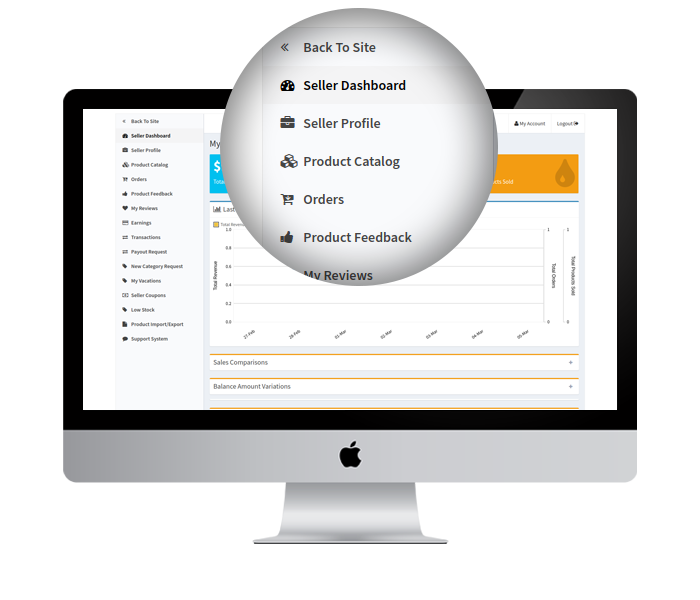 Simplified interface of the Magento Multi vendor Marketplace extension allows the store owners to manage sellers, their products as well as the category of the store with minimum hassle. The admin can approve/disapprove the products or category request from the back-end of the Magento marketplace module. The admin can even enable the auto-approval option from the back-end of the Magento multi vendor marketplace plugin.The entire product list can be viewed and managed with the help of Magento marketplace module.The admin can even allow bulk import and export of products. The store admin need not get intimidated by the multi seller setup as the orders of the third-party vendor can be managed with ease. 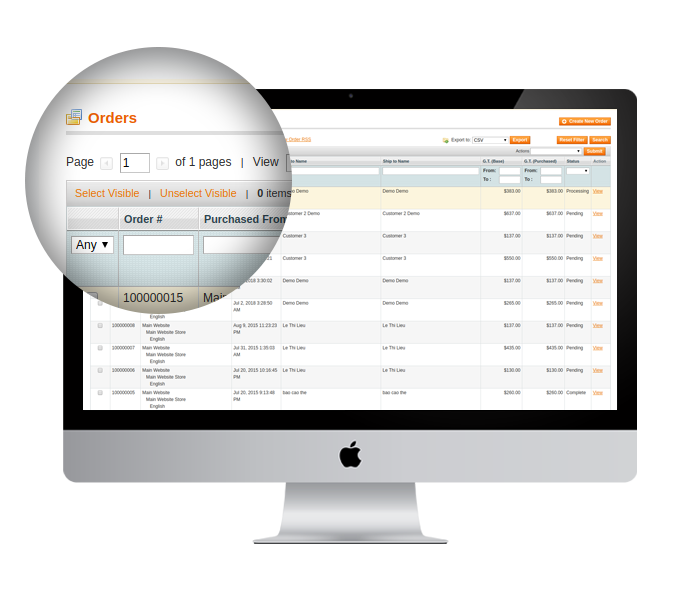 The Magento multi vendor marketplace plugin allows the admin to view the order details and status of the sellers. The admin can even notify the seller about the orders if required via email.The order and sales report allows the admin to compare the performance of the sellers as well. Marketplace extension Magento offers easy tracking to the store owner. No matter the number of sellers of the site, the amount of inventory you are dealing in, the entire transaction can be tracked and managed with ease. 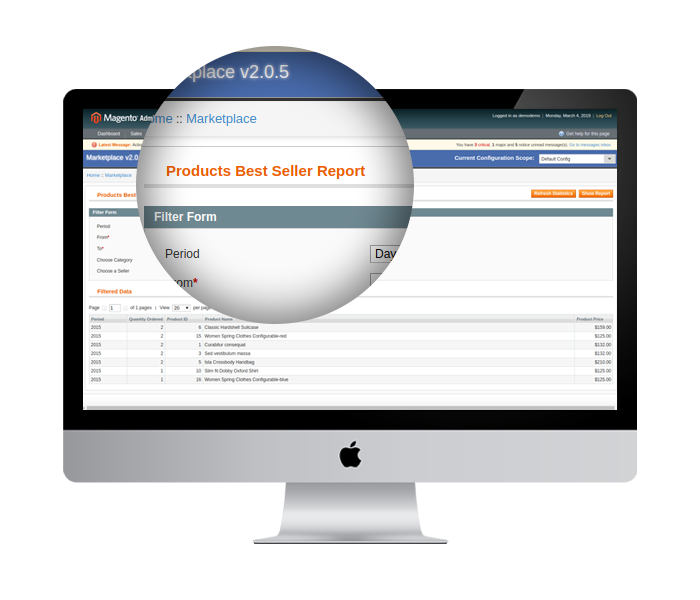 The multi seller marketplace Magento offers a complete sales report of the online marketplace.The admin can even track the performance of individual sellers with the help of Magento marketplace plugin.The Magento extension can even see the bestselling product of a particular category or during specified time duration. The store admin can stay in touch with the sellers via emails. The Magento marketplace plugin offers an automated interface to the store owner to notify the sellers about the various aspects of the online marketplace. 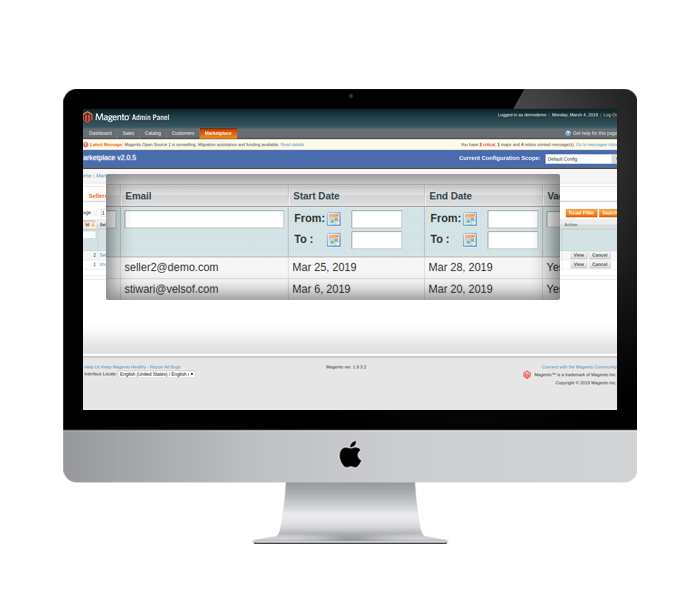 The Marketplace plugin for Magento comes with over 20 default email templates. The admin can send the emails to the sellers and inform about the approval, disapproval of their account, product/category request. They can even inform the sellers about the orders received and so on and so forth.The email templates can be customized with ease from the admin interface of multi vendor marketplace extension for Magento. The robust Magento marketplace plugin is compatible with all the Magento themes and versions. The marketplace module for Magento is compatible with all type of currencies.The Magento Multi vendor Marketplace extension supports all type of products. The attractive interface of the online marketplace attracts both the sellers as well as the customers.The automated and user-friendly approach makes the online transaction easier for the sellers as well as the customers.The sellers can customize their shops as per their need. Hence, the admin need not take the burden of optimizing the front-end. The admin can allow the sellers to go on a vacation mode. If this feature is enabled from the back-end of the Multi vendor marketplace extension for Magento, the vendor can close their shop temporarily. The request of the sellers to go on vacation mode can be seen in a separate tab of the Magento Marketplace extension. 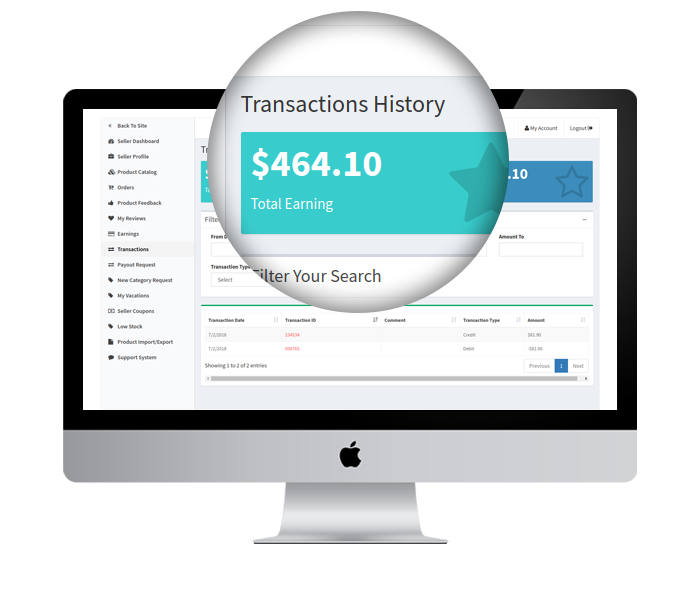 The admin gets to monitor the performance of the individual sellers and the entire transaction of the site with Magento marketplace module.The admin can track the overall transaction and earnings from the back-end of the Magento multi vendor marketplace module.The admin can view the transactions and earnings of the sellers. 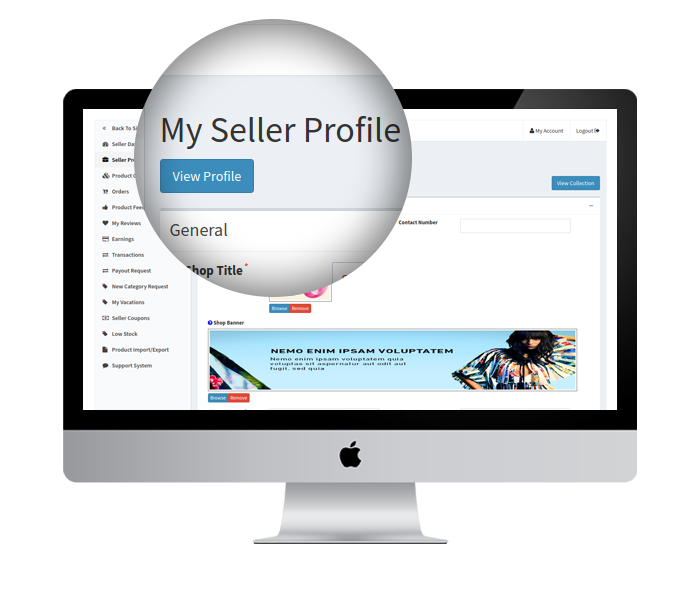 Easy to use and highly intuitive seller profile page to provide access to seller profile from the front side of your store. 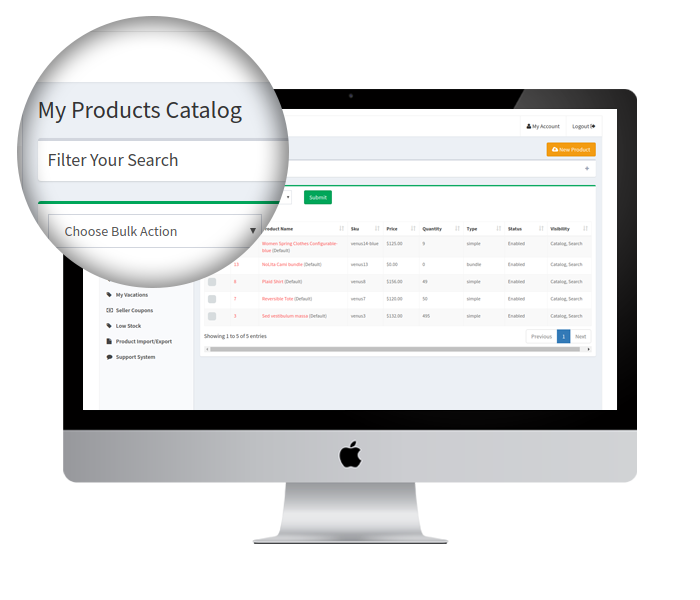 Sellers can manage their account profile and products details easily. 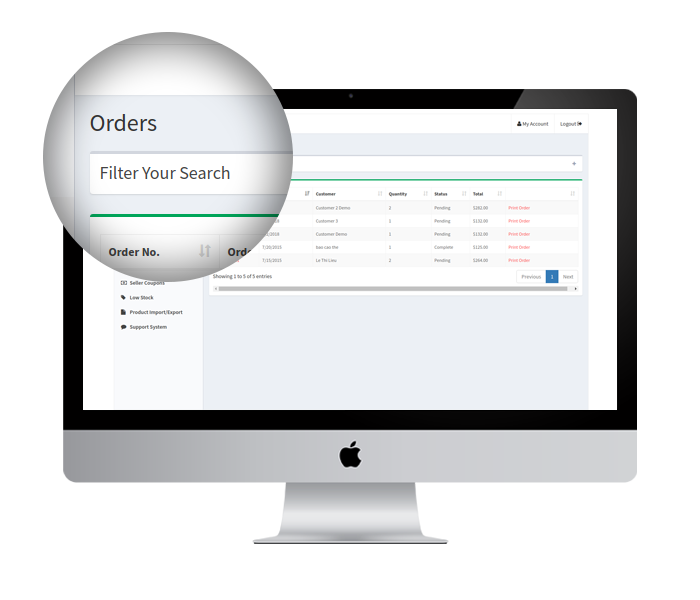 The sellers can apply filters and view the orders received as per their wish.The sellers can get an option to view their reviews and the reviews of their product in a separate tab.The dashboard offers an entire report of the transaction history. The Magento multi seller marketplace extension allows the vendors to manage their SEO with ease. The sellers can get SEO-friendly URL for their marketplace shop.They can enter meta data, that is, the meta keywords and meta titles in their web pages. 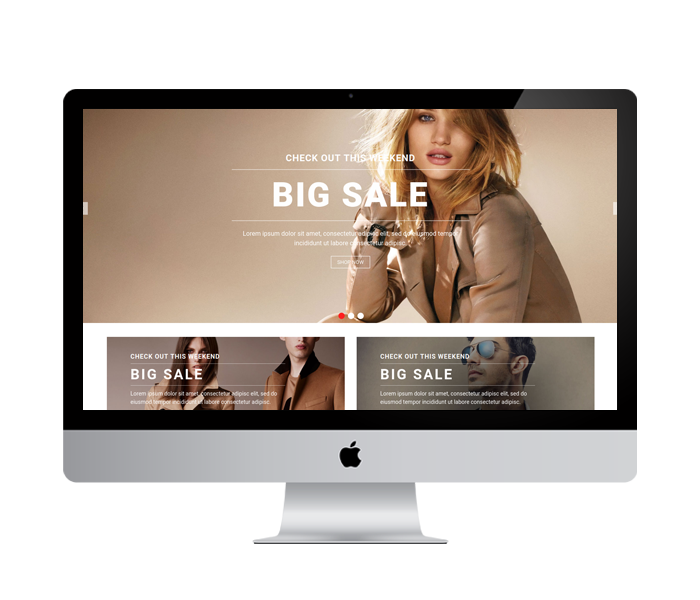 Seller can add banners, shop logo and custom HTML content that will be displayed on Seller Page with separate product collection. Addition of banners, logo and shop details enhances the brand visibility. The Magento Multi vendor Marketplace extension do not offer any backend login to the sellers. 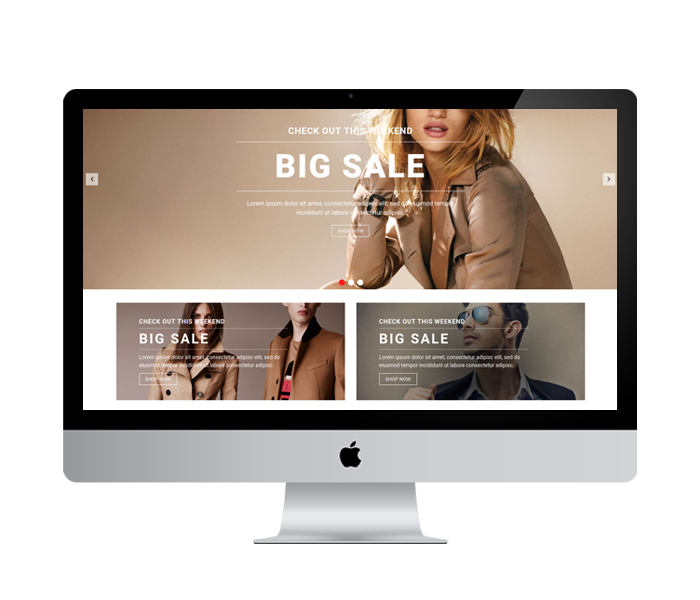 It means that the seller can manage all the activity from front-end of the store only. 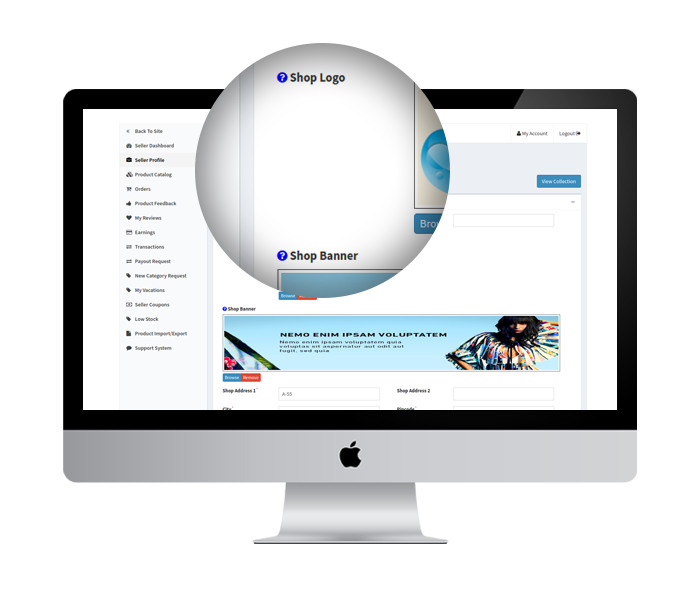 The login page is same for both the sellers and buyers. 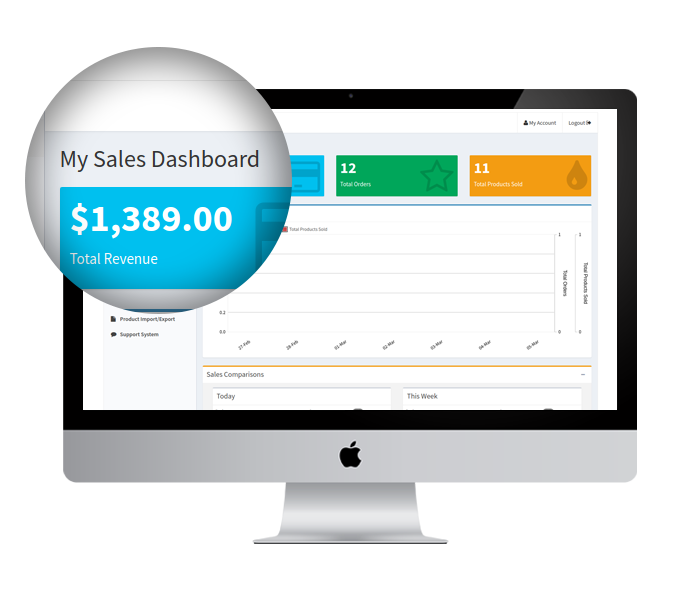 Sellers gets a quick access to track the sales information that includes- average revenue per order statistics and items sold in the form of easy to understand graphs.This report gives detailed information to the seller about their orders and earnings. The vendors get to compare the sales report on the weekly or yearly basis. They even get the report of the balance amount variation. Sellers can add products only in the assigned categories. If the seller wants to use a category other than the assigned one, the sellers can request to add a new category in the marketplace. 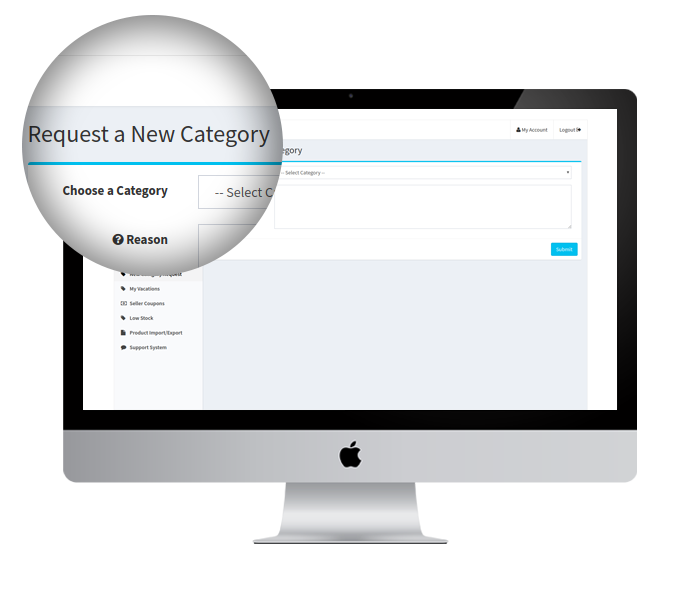 The store admin can approve or reject the category or sub-category request from the back-end of the Magento Multi- seller Marketplace plugin. If the auto approval feature is disabled from the backend of Magento Multi vendor Marketplace module, the products added by the sellers will be sent to the admin for approval. Once the products gets approved by the admin , only then the seller can sell that products at the Marketplace. 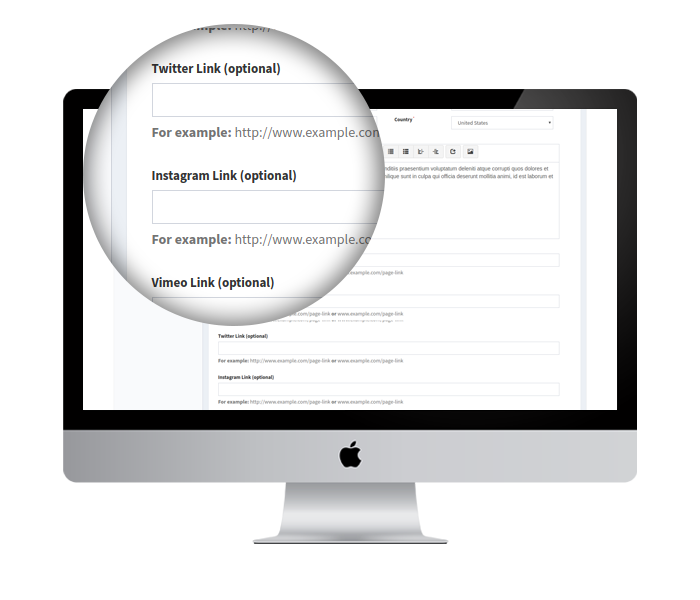 The Magento Multi-vendor Marketplace extension offers a feature to the sellers to enter Social URLs for enabling the social links on Seller's Page. Sellers can add their social account like twitter, Pinterest, Vimeo, Google+, Facebook, Instagram from the seller dashboard. 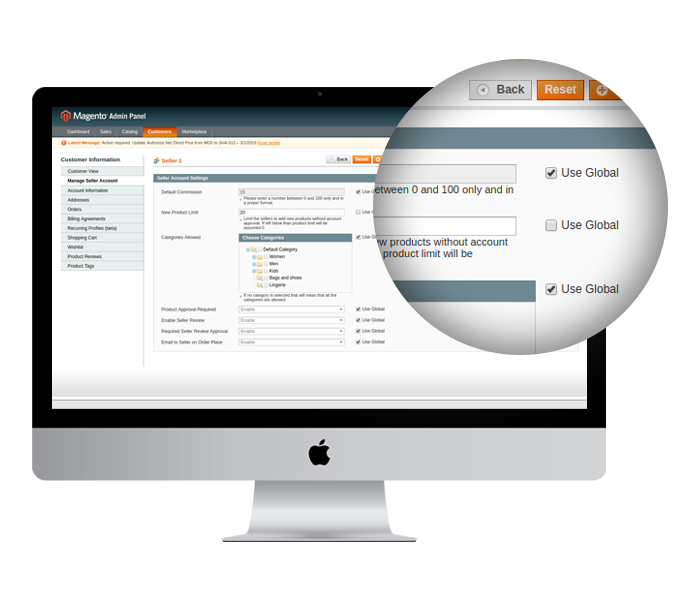 The Magento marketplace module offers a number of default email templates for sending auto-response to the sellers. 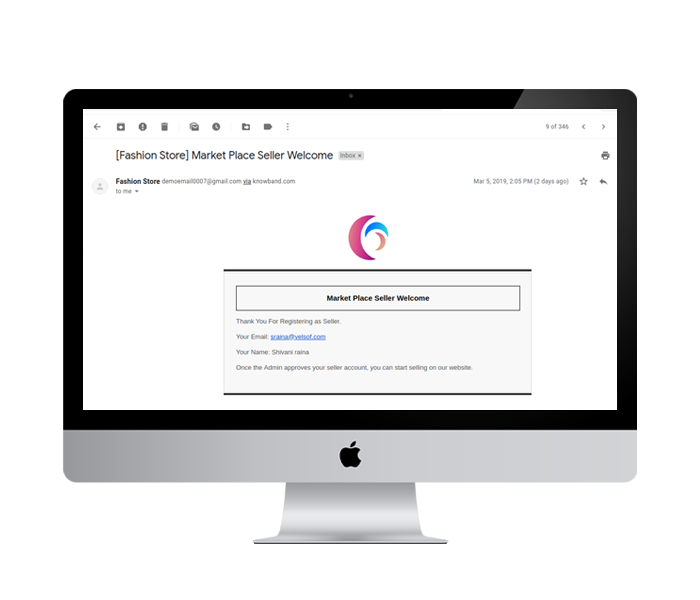 These email notifications will update the sellers about various activities at the Marketplace. The Magento Marketplace plugin offers complete authority to the vendors to manage their transaction. 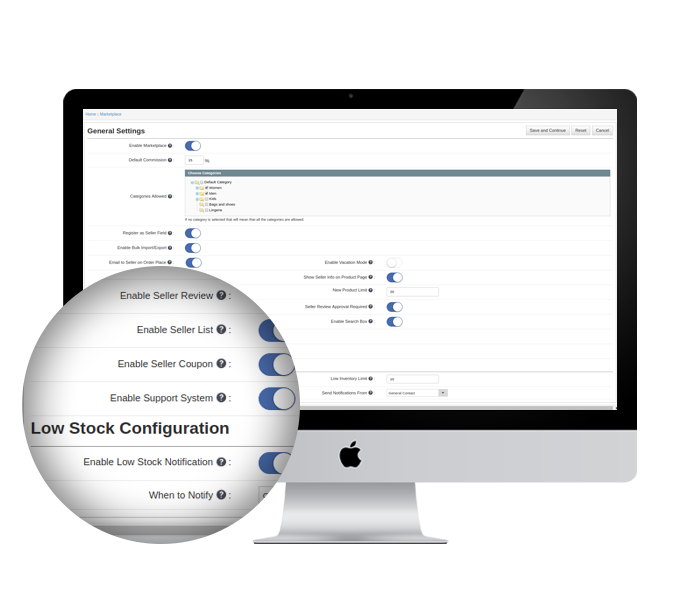 The vendors can manage their profile and track the orders from the dashboard itself. Even the shipping is managed by the sellers. 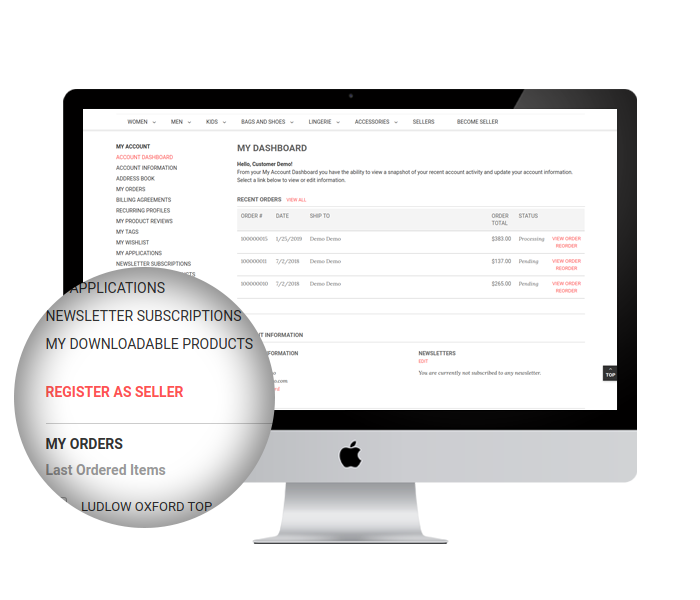 The vendors can view the order details in their dashboard. There are filters available for them to view the order reports of a particular period and process them accordingly. 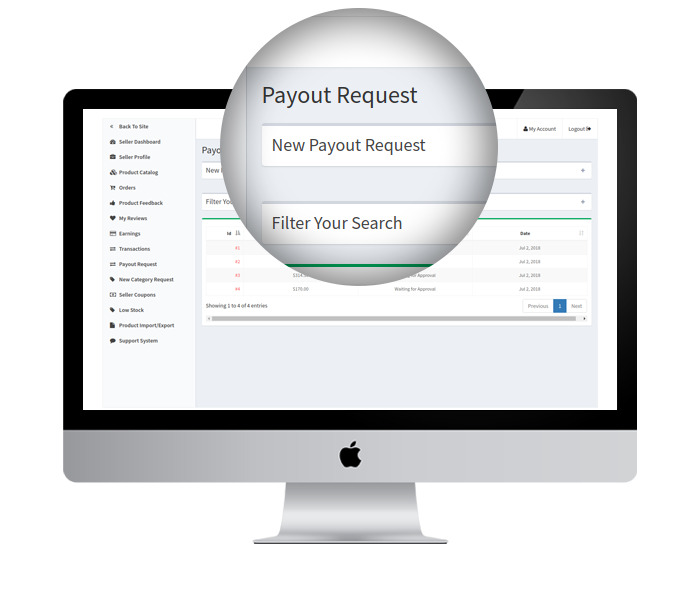 The seller can raise a request for any payout from the dashboard. They get an option to specify the amount and reason of the payout. This request is automatically listed in Seller's Payout tab of the Marketplace extension for Magento. They can review and approve the same. The sellers can fix the threshold limit of the stock. Below the specified limit, they will get a notification regarding low stock. This makes stock management easier for them. The sellers even get an easy option to disable their marketplace shop temporarily after the approval of the admin. 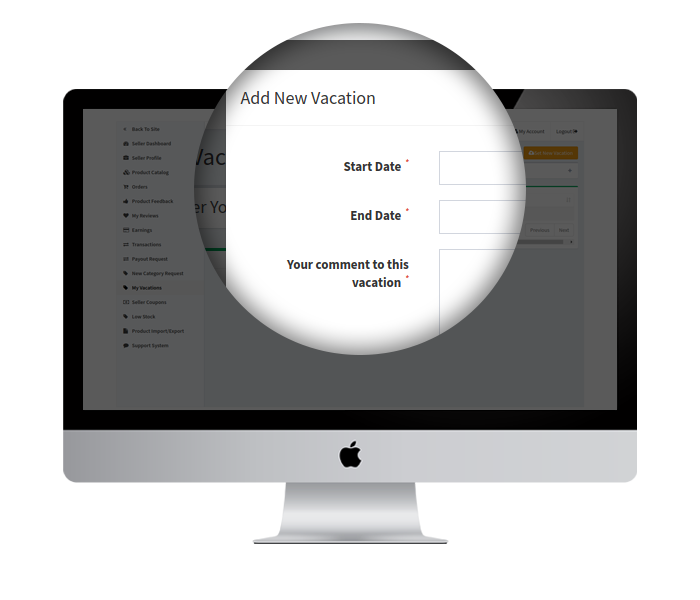 Vacation request can be sent by the seller from a separate section in seller dashboard. Once the seller approves the request. 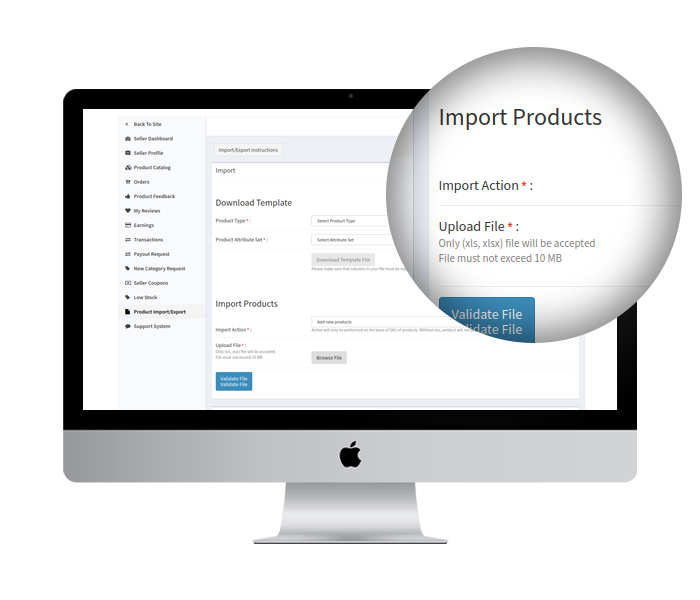 The vendors get an option to import or export the product details in bulk. However, this features should be enabled by the store admin from the back-end of the Magento marketplace. 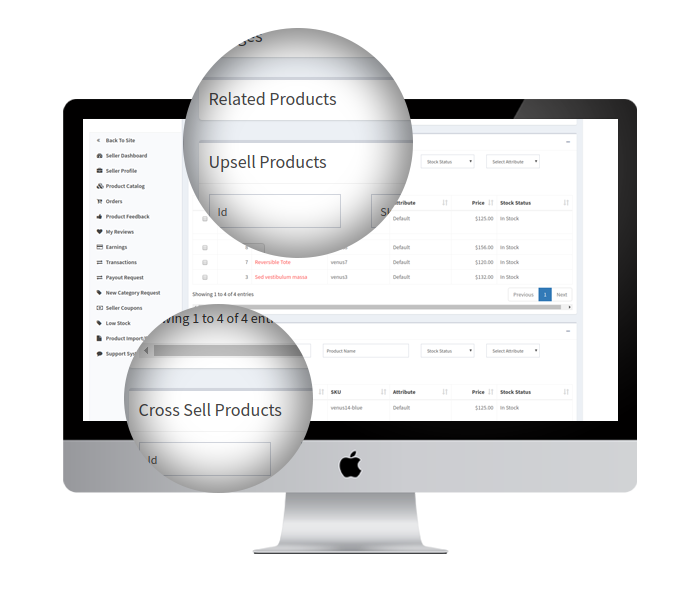 Sellers can add cross sell and up sell products from the profile management section. Cross sell and Up sell products will be displayed at the checkout and product page respectively. Addition of these products enhances the sale and revenue of the store. 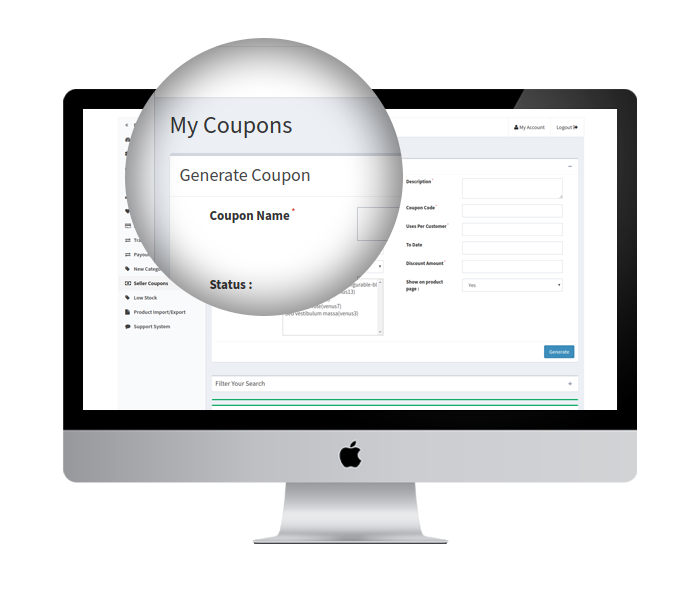 Sellers can create seller coupon for their products. Coupons generated will help the seller to lure the customers to shop more to avail the discounts. The buyers can easily search any seller on the marketplace and place their orders. An interactive interface is offered to buyers to select the items from multiple vendors at the Marketplace. 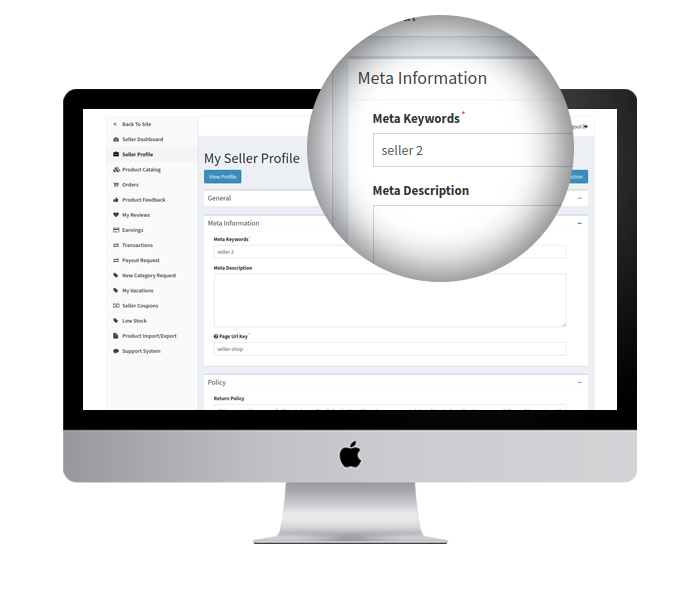 Buyers can view seller’s details on a separate seller page designed for each and every seller. Customer can even contact the sellers directly from the front end of the store.A ticket will be generated every time a customer contacts the seller. This help in building the trust in customer. 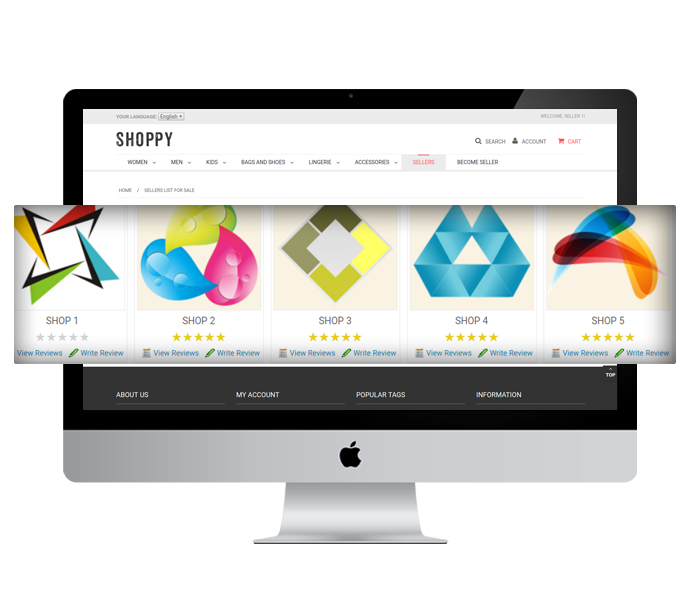 The store visitors can now shop for their favorite product from a larger inventory. As there are multiple sellers dealing in the same marketplace, the choices are ample. 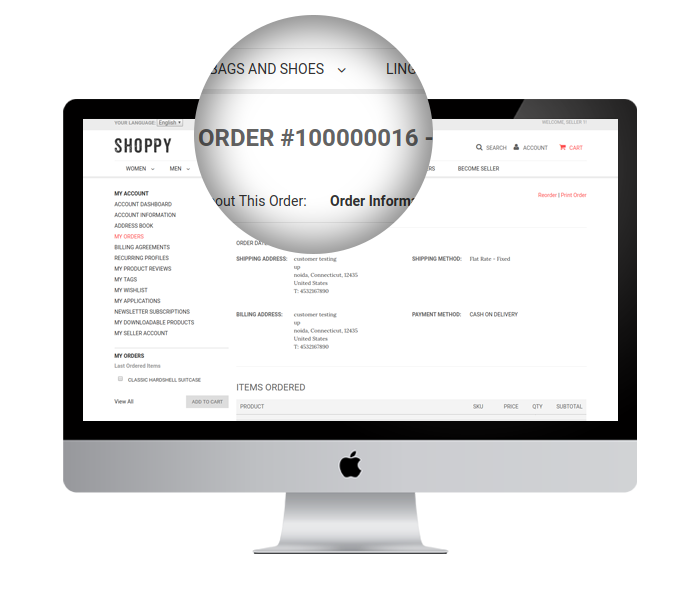 The customers get a single invoice even if they add the product of different sellers in their cart. 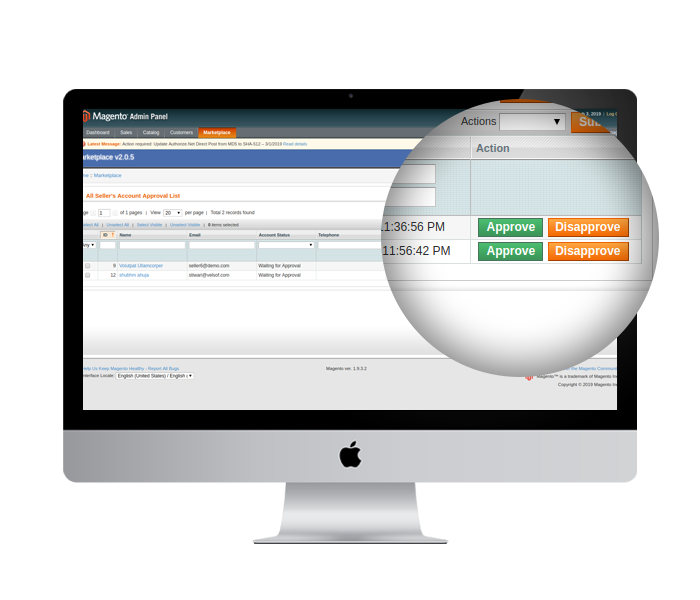 Magento multi vendor marketplace plugin automates the invoice management process. For return/refund/replacement request, the customers need not follow any different process. This can be done in a usual manner. Even if the customer buys the products from different sellers and returns the product of a particular seller, then, the invoice will be sent to that particular seller only. 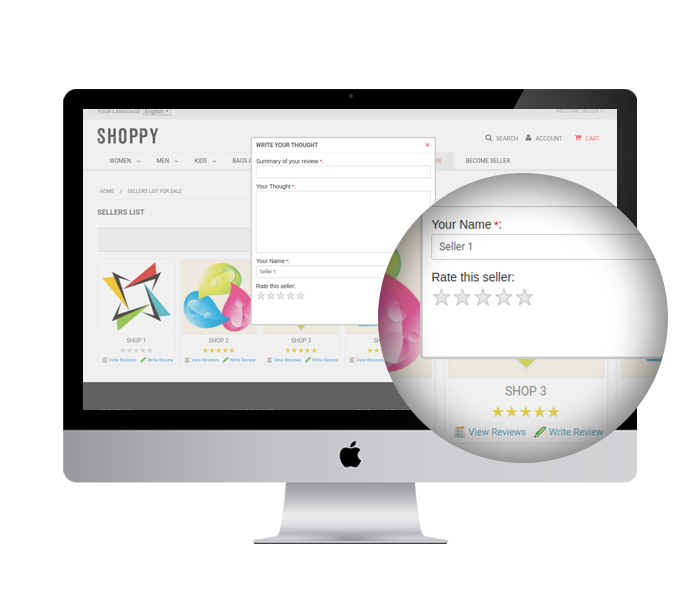 Buyer can view name, review and rating of the seller on each product page. 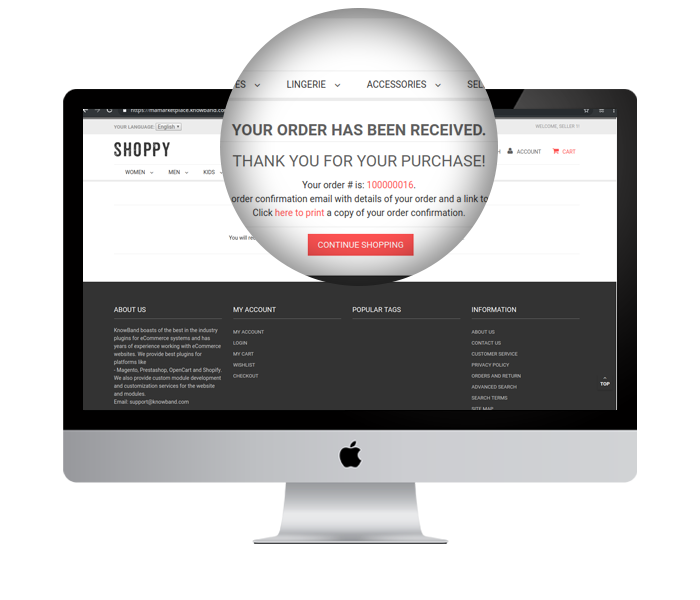 Customers can even send submit their valuable feedback from the product page. Buyers can view related products from the same seller on each product page. Upsell and Cross sell products will help the customer to look for the desired products easily. Every buyer has an option to become a seller on the marketplace. 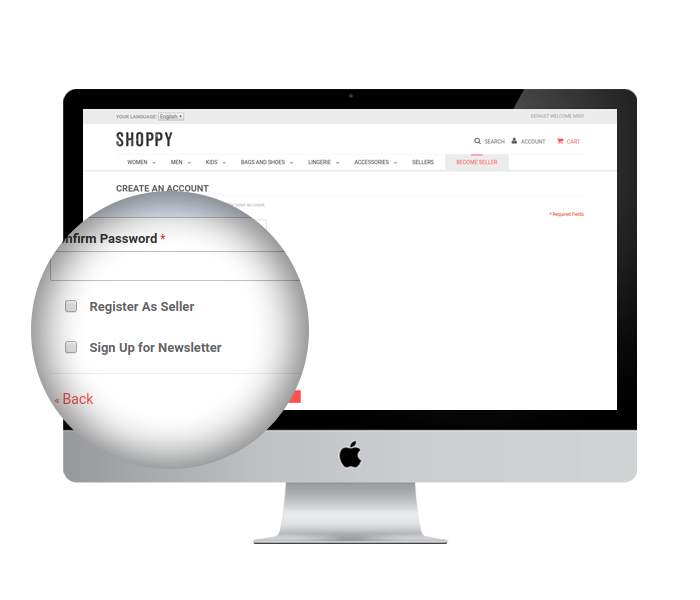 Customers can register as buyer from the frontend of the store.